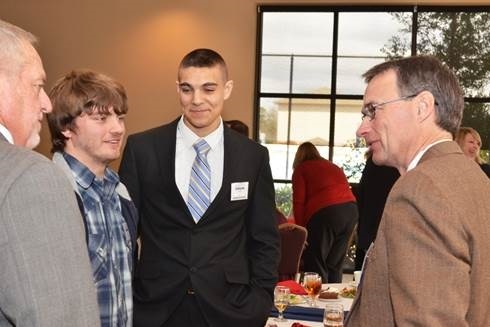 PICTURED: Southern Wesleyan University students Austin Johns-Paradise of Westminster and Jonathan Leveille of Simpsonville talk about their college experiences with S.C. Rep. Davey Hiott, right, as Marty Atcheson, left, Southern Wesleyan’s senior vice president of finance, looks on. Hiott, who is a 1983 Southern Wesleyan graduate, serves House District 4, which covers the Pickens area. CENTRAL, S.C. – Southern Wesleyan University welcomed elected and appointed officials in federal, state and local government to its Legislative Appreciation Luncheon Feb. 23 at the Central campus. The luncheon, which takes place annually, is a time to show appreciation for government officials and to focus on positive relationships these leaders have forged with Southern Wesleyan and its students through their support of federal and state financial aid. It’s also an opportunity to call attention to present and future collaboration that benefits not only the university but also citizens who reside in the surrounding area. “This campus has always been and always will be a campus that is generous and connected in the community in important ways,” said Todd Voss, Southern Wesleyan’s president. Voss, who has spent more than 30 years in higher education, said he has never been at a university that has had such a level of collaboration and support. Voss gave updates on athletic facilities and student-run businesses on the Central campus that are open to the public, such as the P.B. Wood Golf Practice Range and Blue Hill Coffee & Tea Co.
Laurie Buckley, a sophomore human services major from Clemson, told luncheon guests about the many opportunities opened to her thanks to federal and state financial aid, which include mentoring freshmen and representing the university while traveling to several states as part of a summer ministry team. “I come from a home with two other siblings, so money always seemed so tight,” said Buckley. 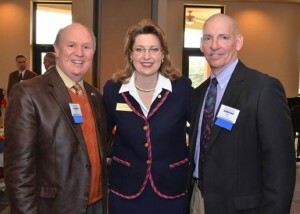 Lisa McWherter, Southern Wesleyan University’s vice president for advancement, is pictured with S.C. Sen. Thomas Alexander, left, and Central Town Administrator Phillip Mishoe, right, during the 2015 Legislative Appreciation Luncheon, held Feb. 23 at the university’s campus in Central. Gavin Potter, a senior ministry major from Central, echoed the importance of federal and state aid during a time when his family experienced financial setbacks. Mike LeFever, President and CEO of SCICU (South Carolina Independent Colleges and Universities), called the students who spoke before him “living examples” of how students attending private colleges and universities benefit from legislative support of tuition grants. “Every time I’m on campus, I am amazed at the fine young people who typify the student body at Southern Wesleyan,” said S.C. Sen. Larry Martin of Pickens. S.C. Rep. Davey Hiott, himself a Southern Wesleyan graduate, remarked that the university is becoming increasingly recognized across South Carolina as a place that graduates future leaders. “These students are a wonderful example of what we’re all about, trying to make sure that we provide the type of education where you can go out and be successful, be right here and in the communities across South Carolina,” said S.C. Sen. Thomas Alexander of Oconee County, adding that he has supported the Tuition Grants Program for a long time. S.C. Rep. Gary Clary of Pickens County said that he signed “about a hundred letters” that were mailed to residents in his district who were awarded tuition grants. Also present were Rev. Ken Dill and Doug Barry of Central town council, Clemson Mayor J.C. Cook, Ensley Feemster of Pickens County Council, S.C. Rep. Neal Collins of Pickens County, representatives from the offices of U.S. Sen. Lindsey Graham, as well as U.S. Representatives Trey Gowdy and Joe Wilson. The SWU Concert Choir, directed by Don Campbell, music professor, performed spiritually uplifting musical selections, featuring solos from music majors Patrick Hampton and Allen Williams. He was accompanied by Jane Dill, chair of the university’s Fine Arts Division.